We have developed a new machine learning method at the University of Sheffield called Turing Learning that allows machines to model natural or artificial systems. In Turing Learning, a machine optimizes models of a system under investigation. The machine observes the system, without being told what to look for. This overcomes the limitation of conventional machine learning methods that optimize models according to predefined similarity metrics, such as the sum of square error to measure the difference between the output of the models and that of the system. For complex systems, such as swarms, defining a useful metric can be challenging. Moreover, an unsuitable metric may not distinguish well between good and bad models, or even bias the learning process. This is the case, for example, for the swarm systems considered here – we prove that using the sum of square error metric one is unable to infer the behaviors correctly. 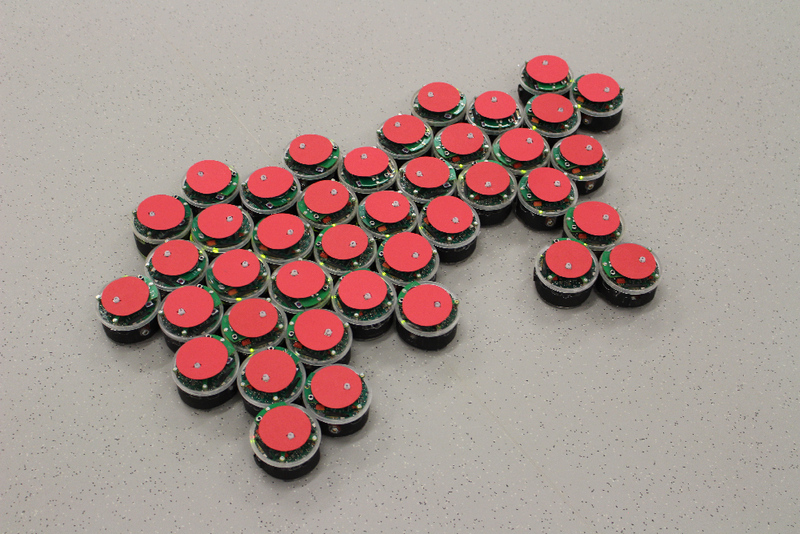 The Turing Learning setup for inferring swarm behaviors. 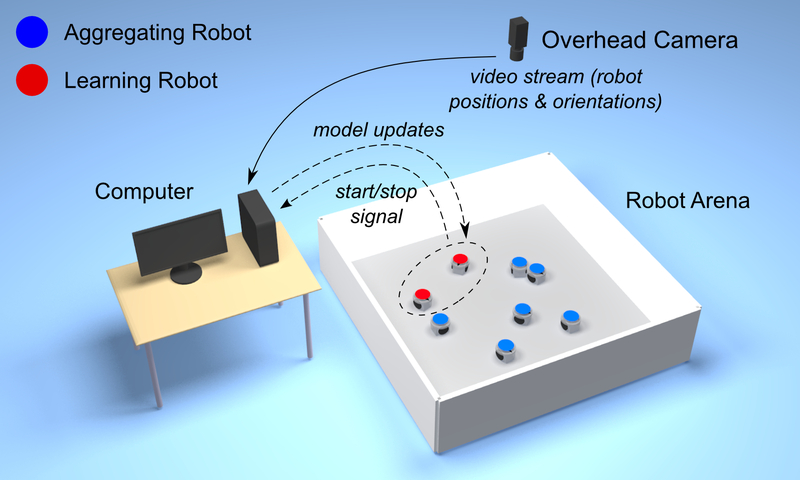 The overhead camera observes both the system under investigation (aggregating robots) and the learning robots. Turing Learning simultaneously learns to model the behavior of the system and to discriminate between the aggregating and learning robots. 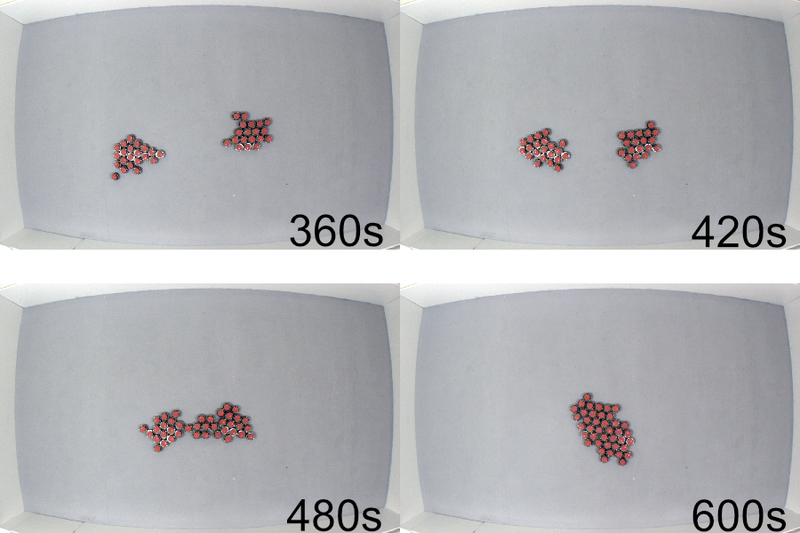 Sequence of snapshots showing the aggregation behavior, as it was learned by the robots. Turing Learning could prove useful whenever a behavior is not easily characterizable using metrics, making it suitable for a wide range of applications. For example, computer games, could gain in realism as virtual players could observe and assume characteristic traits of their human counterparts. They would not simply copy the observed behavior, but rather reveal what makes human players distinctive from the rest. Turing Learning could also be used to reveal the workings of some animal collectives, such as, schools of fish or colonies of bees. This could lead to a better understanding of what factors influence the behavior of these animals, and eventually inform policy for their protection. 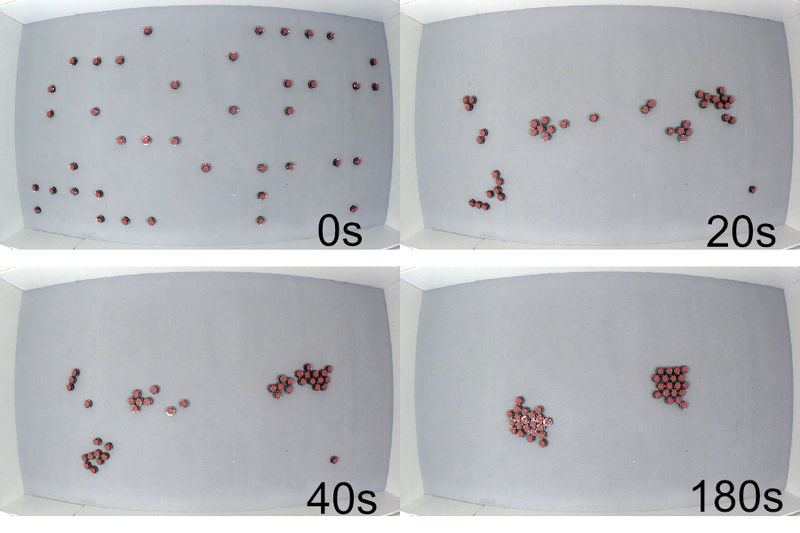 The study is published in the September issue of the journal Swarm Intelligence.